The durable machine-made Pinot Noir and Nebbiolo glass of the functional glass collection Wine features a light-catching, decorative stem. The shape of the bowl supports peatiness flavor and the taste of plum of these sensual red wines. 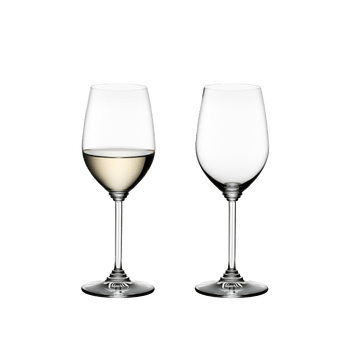 This special collection was created for customers, who feel that plain stemware on a well laid table is just not decorative enought. All RIEDEL glasses are dishwasher safe. The WINE collection was made for customers who want the full „key to wine“ concept, but with a decorated stem. WINE combines a lightcatching, visually engaging stem and VINUM‘s most popular varietal specific bowls.